Grown for its golden green, arrow shaped leaves and spikes of bight red summer flowers, this reliable perennial blooms non stop from mid summer to the first frosts providing a lovely splash of late summer colour to the border. Categories: Autumn, Featured Plants, M-P, Plants A-Z, Plants by Season, Plants In Situ, Spring, Summer, The Hot Border. 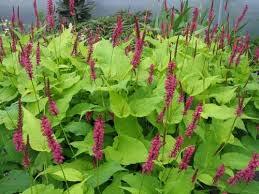 Relatively new introduction to the Persicaria family, Golden Arrow possesses soft golden foliage which is a great backdrop for the 18′-24″ flower stems bearing spikes of flowers the colour of Cardinals’ slippers! Easy to grow and very hardy this plant will thrive in a good moisture retentive soil.P.Golden Arrow will cope well with full sun so long as its well watered though its also easy to grow in shade where it lightens up the darkest corner. Forms clumps 2-3 ft tall and wide and spreads via rhizomes so watch it carefully lest it get out of control!